The US Centers for Disease Control and Prevention released a report on Wednesday indicating more than 100 cases of measles spread across the United States thus far this year. Between January 1 and July 14, 107 cases were reported in 21 states and the District of Columbia. 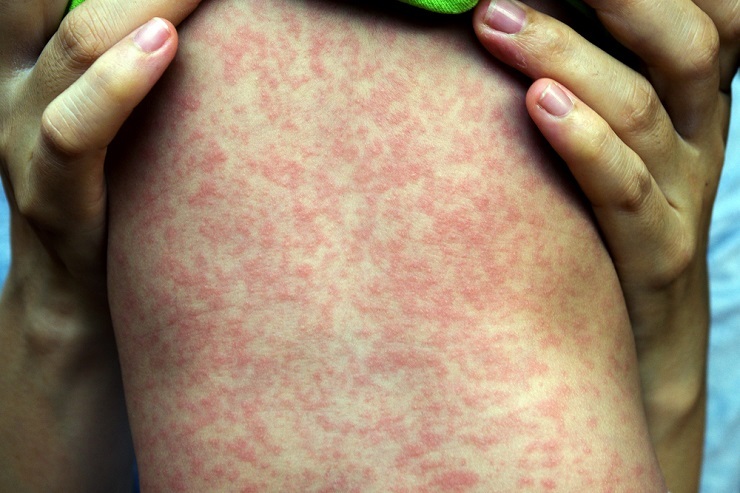 Measles is a contagious virus that starts exhibiting symptoms between 10 and 14 days after exposure. It is spread through droplets from coughing, sneezing, and even talking. Infected droplets that land on a surface can stay active and contagious for up to several hours. Symptoms include fever, cough, runny nose, inflamed eyes, and a skin rash of large, flat blotches. The virus can be spread by an infected person for up to four days before symptoms even appear. Roughly 90% of susceptible people (those who are unvaccinated) who are exposed will become infected with the virus. Those who have been infected with measles this year live in Arkansas, California, Connecticut, Florida, Illinois, Indiana, Kansas, Louisiana, Maryland, Michigan, Missouri, Nevada, New Jersey, New York, North Carolina, Oklahoma, Oregon, Pennsylvania, Tennessee, Texas, Washington, and the District of Columbia. According to the CDC report, the majority of the people who got measles were unvaccinated. The decrease in vaccination rates correlates to a now-discredited study published in 1998 that had falsely linked the measles vaccine to autism. In all of 2017, 188 people from 15 states and the District of Columbia were reported to have measles. This was up from 86 people from 19 states in 2016. The most recent measles record since the disease was documented as eliminated from the US in 2000 occurred in 2015 when 667 cases were reported across 27 states. That outbreak was linked to an amusement park in California where it is likely that an infected traveler from overseas visited the park while contagious. It is estimated that one to two out of every 1,000 children infected with measles will die from associated complications. Worldwide, an estimated 450 children die each day from measles, and it is one of the leading causes of death for children. The only ways to prevent new infections is by preserving herd immunity, which is dropping in the US as people opt out of vaccinating their children. The first dose of the vaccine for infants is provided usually between ages 12 and 15 months, so before then, they are at risk for contracting the virus. Others at risk include those who are immunocompromised and are therefore unable to receive the vaccination. One dose of the vaccine is about 93% effective in preventing infection whereas two doses are 97% effective. For herd immunity to be achieved, at least 95% of the population must have received the recommended two doses of the measles vaccine.